You may have read that the root of wild parsnip is edible – and even sweet, after being exposed to cold. But don’t risk it. We are at war with this plant. It is armed and dangerous, and blatantly defies the Geneva Convention’s rules regarding chemical warfare. ...Wild Parsnip in a part of our land where we are not winning the war. The sap contains furanocourarins, a toxic chemical that soaks into your skin, reacts to sunlight (even on cloudy days) and damages the DNA in every cell it comes into contact with. The result is painful blistering and dark purple scars that will last for years. Here is the creepiest part. You may not realize wild parsnip has attacked. It doesn’t sting or burn on contact. The reaction takes some time — even days, and by the time you realize you’ve been slimed – the damage is done. If you do get parsnip sap on your skin, or even suspect that you did, the sooner you wash the area the less you will be affected. Check out this site for details. I live in fear that I am going to inadvertently apply a thin but adequate coating while wiping the sweat off my cheek and wake up with a new nickname – Scar Face. ...No matter where you live (except the lucky white states) you are not safe! When we bought our land in the fall six years ago, many acres were filled with toddler trees just a few feet tall. Our first spring we watched in horror as wild parsnip sprang up buried them in its thick, green foliage and sickly yellow flowers. We borrowed a brush mower and declared war. Having found out the hard way in our first feckless skirmishes what wild parsnip can do to human skin, it took some nerve, to plunge into the 10-foot wide swaths of parsnip between tree rows that towered to 8 feet, but as we cut it down year after year the trees began to gain ground. That’s when another, more surgical tool entered our lives. The scythe. With this amazing instrument, we could slip the curved tip of the blade into a group of plants, hook the parsnip stem, give a firm tug and leave the native flowers standing tall. 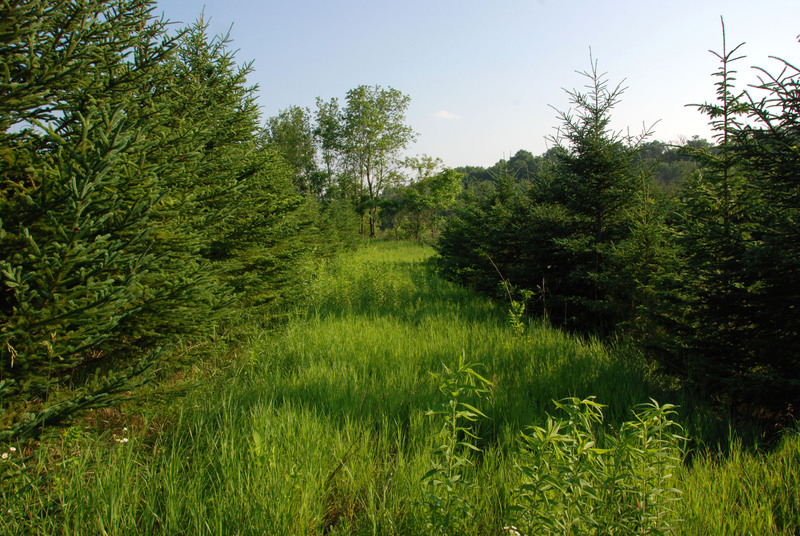 ...A few years ago these spruce were once buried in wild parsnip -- but no more! Wild parsnip begins life as a rosette close to the ground. It can go on to its towering, flowering stage the next year, and usually does. The time to cut is just as they flower but before they can drop their seeds, which is usually early July but has come early this year (climate change?) . So theoretically, in two years, you could rid an area of this invasion. In real life, it’s not so simple. Wild parsnip may spend a number of years as a rosette, and it’s heavy, vital seeds can live in the soil for at least 4 years, so we knew from the start it was going to be a long campaign. Six years into this war, we are starting to see some success. Certain areas, such as our prairie, glade and around the barnyard, (the areas we have declared zero tolerance) are starting now sport very few of those flat, yellow flowers. If you have wild parsnip, you can beat it. You’ll have to go after it several times each season, and cut it again. It’s got a massive rootfull of energy, and it will send up another flower. Cut that one too. It will be smaller. If necessary cut it again. It gets easier. I would love to hear from anyone who is warring with this green meany. Are you winning? Thanks for posting a link on my blog, it is good to see you are managing to make headway on this plant. 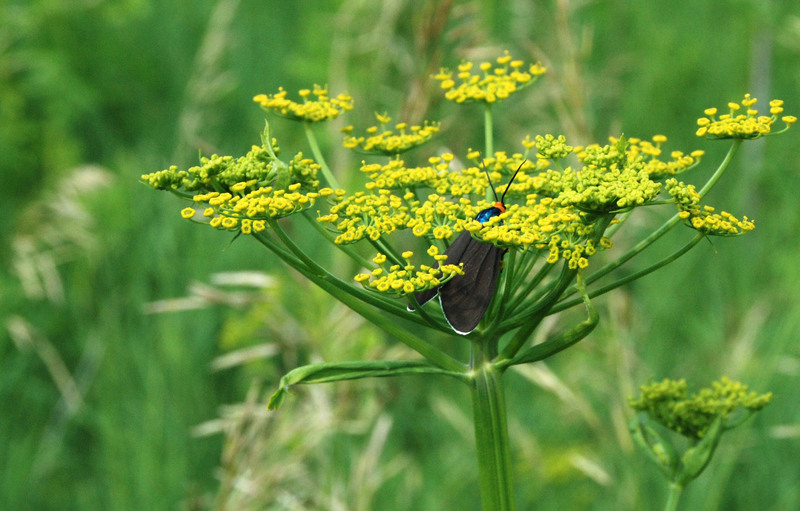 As we drive around Latvia we see a lot more wild parsnip than we realised existed – I guess we weren’t looking until it appeared on our land. I am also pleased that I decided it had to go and we didn’t wait around to see what happens with it. After the rain today my husband will be out tackling some more that we have seen and hopefully we have nipped it in the bud and just in case it is flying in from other fields he is going to have a wander round and cut down the offending plants nearby. Fortunately most farmers are cutting their fields right now but we don’t want to because we will disturb the corncrakes which are a threatened species and nest on our land. Thank you for the link to your post. It’s great to hear about people winning the war against Wild Parsnip and other aggressive exotic plants. I found the link to Scythe Supply (www.scythesupply.com/) elsewhere on your blog. Can you tell me which blade you use for Wild Parsnip? I just looked at the Scythe Supply website, and I think they have changed their line a bit in the past few years. But if I were getting a blade for wild parsnip from their current selection, I would pick the Tops blade. The grass blade (which we use for mowing) is too whippy. The brush blade would work, but is heavier. We have two blades that fall in the middle — one for a left-handed and one for a right-handed snath. (Doug being left-handed, and I right.) But in fact, we select either one, and if we are working together, we trade back and forth every 10 or 15 minutes because it is less tiring to switch sides. If you get a scythe, I guarantee you will love it. It is such a surgical weapon. You can actually reach the tip into a group of plants, curl it around the parsnip stalk, and give a slight tug to bring an average size plant down. The other native plants are left standing, and will help crowd out the regrowth. For some of the monster plants that can tower to 8 feet and have stalks more than an inch in diameter, they take a little more momentom and a slicing blow to bring them down, without having them fall directly toward you (an undesireable conseqence). People have been using scythes like these for a very long time, It is a great way to work. But you do need to get one with a good blade that can (and must) be sharpened regularly. That is what makes them work so very well. We too have been trying to get rid of this plant. It is aggressive. Hopefully with regular cutting we will be able to keep it back. Even though we cut our field in June, we have flowers now in mid-July. Tough stuff. Tough stuff indeed! But not invinsible in hand-to-hand combat. And persistence is the only thing that will win out in this contest. That’s a good question. My experience is that dried stalks are not dangerous, but I’m talking about dried by time and nature in the fall stalks. I would handle a pile of recently cut and dried stalks very gingerly. And I would handle clothes that i knew had the sap on them as little as possible till they were washed. I know this is an old blog post, but wanted to put my experiences on the record for future viewers. We are starting to see lots of wild parsnip in Minnesota and Wisconsin. It’s virulent seeds are traveling down the road in the backwash of big trucks. My own 40 acres had a roadside ditch full of them. At first, I tried spraying individual plants with Roundup (glyphosate). It killed the parsnip dead in short order (crispy brown in less than a week), but left a scorch mark on the ground where the overspray hit. Not a perfect answer, although it leaves a good spot to throw in some native flower seed. Next, I tried 2-4-D, which should kill broadleaves and leave the grasses. It put a heck of a wilt on the parsnips, but didn’t kill them. They still flowered, but now, since they were all curled, they were harder to spot in the tall grass. One day, after a good rain, I donned the long sleeved shirt and gloves, and pulled several thousand of them down two 1/4 mile long ditches. With a two-handed grab and wet, soft soil, they pulled pretty easily. This makes handling the dirty clothing afterwards pretty scary! The parsnips that had been sprayed with 2-4-D did not pull well. Their curled stems were weakened enough that they just snapped off. I won’t try 2-4-D again. Recently, I bought a specialized shovel, called a “parsnip predator”, which works very well for cutting the crown off the root, This kills the root so that it can’t send up fresh shoots. It works very well for spot control. http://www.theprairieenthusiasts.org/merchandise/predator.htm Be sure to continue to wear long sleeves and gloves, and maybe something on your face, as sometimes the stem whips towards you when cut this way. Keep the shovel sharp, because the big old roots can be pretty woody. The small parsnips are still growing under the native grasses, so I will have to pull or cut them in their second year as they flower, before they seed. I will pull if the soil is damp (because it goes much more quickly), or cut with the new shovel if dry out. Hopefully, progress will be made. My 40 acres are now free from visible parsnip flowers and seed heads. There is so much parsnip in the neighboring ditches and fields, though, that it will be a long battle until the neighbors wise up and control their own. Something to do between battles with buckthorn, I guess. The urgency of getting them before they seed has been getting me out in the country more often, so that is a good thing, although I’d rather be fishing. 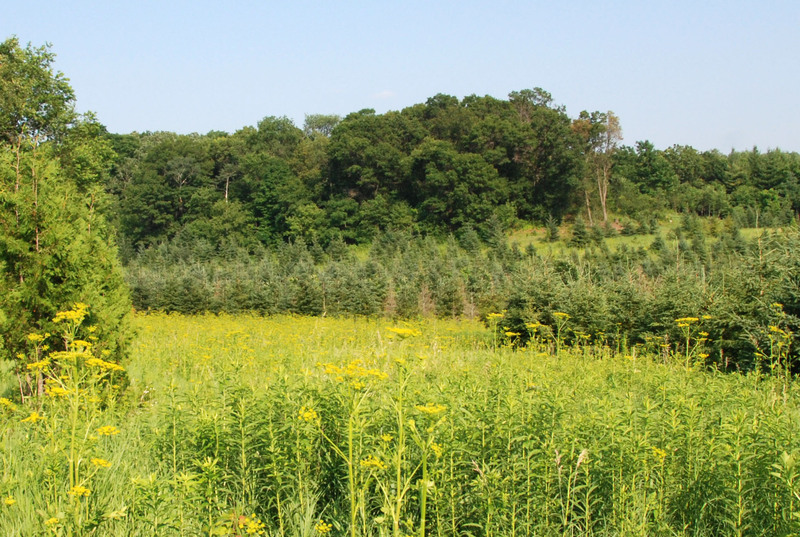 One thing that was mentioned on either the Wisconsin or Minnesota DNR website, is that parsnip is one of the first things to green up in the spring. This makes it vulnerable to a glyphosate attack which will not hurt anything that has not greened up. Will test that theory next spring. Good luck to all, and may you win the battle and we all win the war. breakfast, when having my breakfast coming yet again to read additional news. Thanks for your timely comment on eating wild parsnip. Just yesterday I started my annual July effort to cut this aggressive plant down before it goes to seed. Have you tried eating it? I’d be interested to hear about your experience. I have pulled thousands of parsnip roots out of the ground in my never-ending task of trying to keep it from crowding out native vegetation, and the roots seem pretty tough and fibrous to me – And far too numerous. If I wanted to see the parsnip on my property consumed, it would probably take the entire population of nearby Madison, WI, to eat it all. And I agree with another comment on the link you supplied that people need to remember that the sap from this plant, when combined with sunlight can give you a VERY (I speak from experience) NASTY chemical burn that leaves a purpose scar for at least a year. I don’t really see a silver lining to this invasive. Use Roundup on it once a month. It didn’t come back next year. That’s a LOT of Roundup, Mike. And it doesn’t seem possible that monthly Roundup in one year would eliminate a plant that is biennial. I’m happy with our more hands-on method. We are having great results. Birds and other things will always be introducing new seed, but we have got it down to a dull roar now.